This past week was one of glorious change at Frank Lake Church in the Grove! Not just change … but restoration, growth, encouragement, and hope. Let me tell you how God is working in the day in and day out of the old building that sits next to our home. The week was whirling by, and I was on a deadline for finishing up my book for our women’s Bible study. Every time I would walk by our kitchen clock, I could hear it whispering … hurry, hurry, hurry. The hours would pass, as 6:00 a.m. would race to meet midnight, and then start all over again. I worked through the hours, day after day. I crammed down a peanut butter sandwich, gulped my ice tea, and switched over a different set of background tunes to listen to, and opened my Bible for discovering more about why Jesus was up on that mountain in the first place, when the phone rang. This is what I struggle with; it’s what God knows best about me … I am no good with interruptions! I answered and spoke with a sweet woman from the area who wanted to come over (right then), bring her friends, and look at the old church. It has been horrifically hot and so I have watched the painter, Gary, from afar, as he has tackled the job of giving the church a fresh coat of white paint. I have not ventured to work there this week. I have now worn a path from my house to the church. I told Farmer Dean we should put a sidewalk in soon. As I walked the path, I arrived to the faces of smiling women as they exclaimed over every minute detail. While inside, they told me how they’d followed the move. One of the women thanked me and said, “Thank you for continuing the work and the worship, that the people began in the 1900’s. You are honoring their efforts, their worship of God. You are doing an amazing job!” And with those simple words, I felt a fresh breath of wind wash over me, so that I could continue to work on my task. Thursday night rolled around and a women’s ministry group from a neighboring town arrived for worship, the story of the church move, and pink lemonade. I prayed because I suddenly felt all alone, as though no one knew me, my story, or anything about the church. As I prayed, in walked my sweet friend, Marie (She and her husband, Dennis, sold us the church for $1.00). I felt instantly embraced by God, as He sent Marie to be a support to my psyche. As the women walked in, I began my tour guide approach, and gave them details of the history of the church. Once finished with my talk, we sat down for our melt-in-your-mouth sugar cookies and pink lemonade, and they began to tell me that several of them were married in the old church. 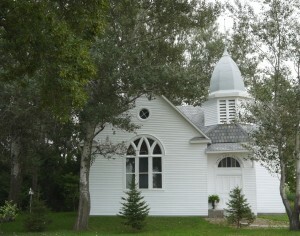 Not only were several married there, but several had attended there when they were small. A few pointed to my photos of the old church people (from 1900-1950) on the walls and said, “Look! There’s Grandpa!” and “Look! There’s my aunt.” I was mesmerized. I was stunned. I was elated. Once again, there was connection. I knew that the next morning I would be headed to chat with a kind man named Tim, from Spicer. As I told them that Tim had an old journal from 1930-1935, written by a Godly woman whose family hosted the same circuit pastors that spoke at Frank Lake, with journal entries talking about the church days, they said, “We know her!” One grandma began to relay memories of Esther. One woman told me she was related to Tim, and that my new assistant, Bernadette, was Tim’s sister-in-law. Again … the dots were connecting. Those words served as another strong shot of encouragement into my weary body, and I was off the next day to start my search for the journal. The day was warm as I looked over the beautiful blues of the lake and chatted with Tim. Tim told me how this wonderful woman, Esther Moberg, wrote in detail about how the pastor, who served my beautiful church’s congregation, walked 6 miles from Frank Lake Church to rural Murdock on Sundays, while waiting for a ride to get to the next church to speak. Who would do that? Would I walk that far in the heat of the day like today, to serve a little church? And yet … Esther said, “Alf (her brother) and I went to F. Lake (Frank Lake Covenant) today. A special service. Many souls came to Christ.” It was worth it all …wasn’t it! 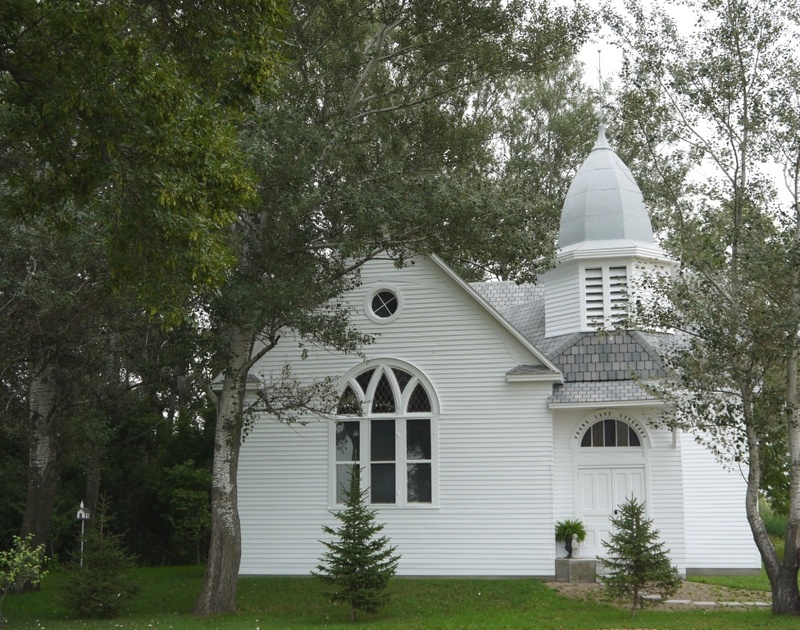 I watched as God took the large pencil of my life, and drew line to dot, line to dot, and I watched Him connect salvation, heritage, scripture, people, and Himself … all to one big old beautiful church building. Well, isn’t that what God does? Doesn’t He, the Author of Life … make all things new? Thank you, God, for connecting the dots in our lives. Thank you for bringing people to encourage us when we are worn out. Thank you for loving us and making a bridge between the past, the present, and the future. To You, and You only … be all glory, and honor and praise.” In Jesus’ Name … Amen. God is so good!What an encouragement to everyone! One of my favorite things in life is watching God do His eternal “Dot To Dot” connections!